Inspiration and Planning: I only stumbled upon the Canadian Rockies. In an effort to not miss the next must-do hike, I found myself searching through blogs and “Top 10” lists in search of the best trails in North America. I made a list of what looked to be my favorites that included Gros Morne in Newfoundland, the Wind River Range in Wyoming, the Collegiate Peaks in Colorado, and several other equally stunning trip itineraries. Not a one would be disappointing, I’m sure, but I could only choose one. The first picture I saw of Jasper Parc National was that of the Ramparts reflecting in Tonquin Lake. The image of the sharp, well-defined peaks were unlike any other and the aura surrounding the Canadian Wilderness took over as my next obsession. I ordered the maps (#902 and 903 from National Geographic) and the planning began. My recent trips had landed me in the severe backcountry of Alaska, meaning float planes, isolation, and true exploration. All things come with a price: long days, prolonged exposure, and difficult terrain defined these trips. I wanted to find a balance between all these conditions and the trails at Jasper N.P. seemed to offer exactly that. 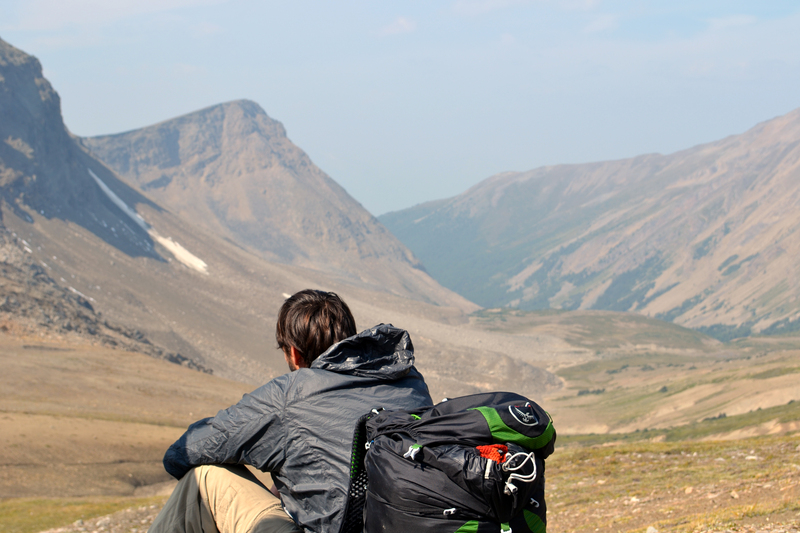 Despite the allure of Tonquin Valley, we didn’t even end up selecting the trek. 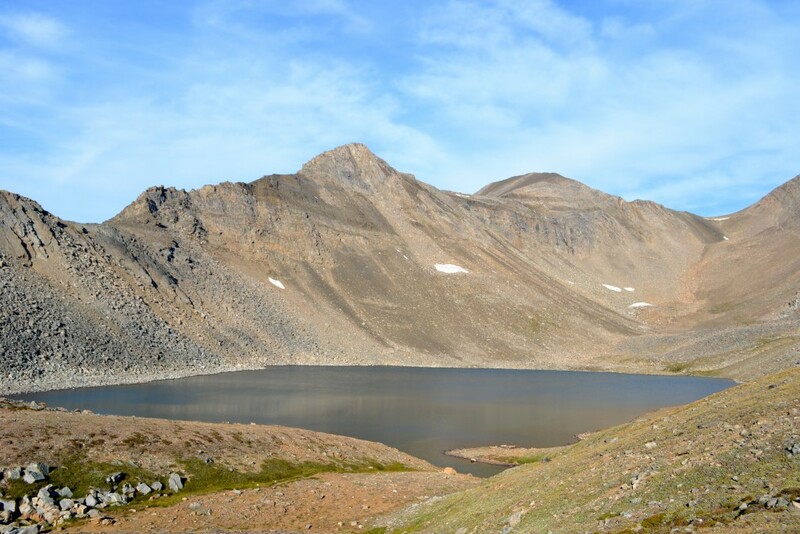 After research and group discussion, we decided to hike both the Skyline Trail and the Berg Lake Trail, the latter of which is actually in Mt. Robson Provincial Park. The Skyline would boast smaller camps, one-way hiking, and almost all of the trail being above treeline or in the high alpine meadows. 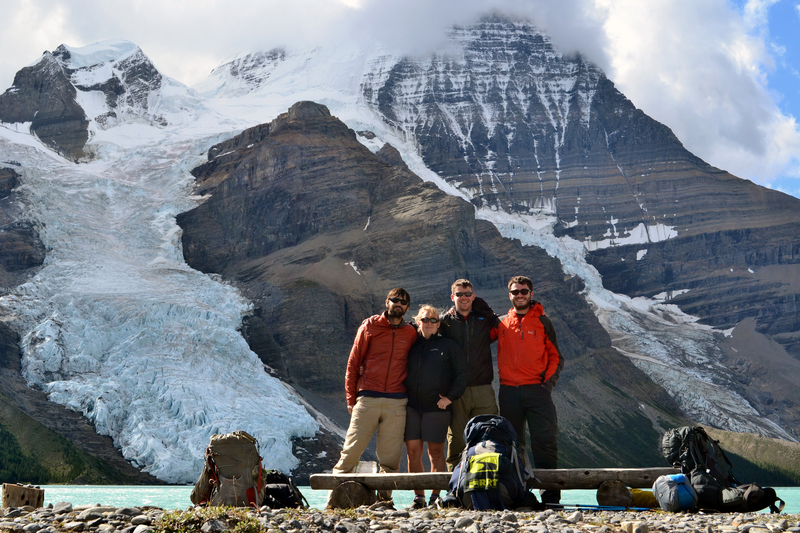 The Berg Lake trail boasts turquoise lakes, glaciers, icefields, and the highest peak in Canada, Mt. Robson. at 3954m. With all of this in mind, this trip seemed to have the makings to be every bit as epic as my previous Alaska trips. The team was assembled, all familiar faces. Vince would be my tent-mate, partner in crime, and equally paced hiking buddy. Also joining us was Kevin and Liz, who have previously accompanied me on my winter treks of Mt. LeConte in the Smoky Mountains. I took lead on the planning and logistics, more so than I ever had on previous treks. This made me all the more excited as I was taking more of a leadership role. Taking the trip one step at a time, I quickly understood the time sensitive importance of booking our camp sites. All sites on these trails are mandatory reservations (new as of 2013, I believe) and they fill up fast. You can call at 9am exactly 3 months to the day before the very first day of your trip in that park. Important facts that I learned (each requiring a separate reminder alarm): booking is done in Pacific Time, each park (both Robson and Jasper) book separately, and you can only leave a message with your contact information and requested itinerary. They will then call you back ASAP. After getting confirmation of our campsites, our group would meet to review weather patterns, transportation details, airline tickets, rental cars, and equipment considerations. All that was left to do at that point was to wait. For me this was easy, I’d work too hard to think about anything else. Airfare from Cincinnati to Edmonton, Alberta CA was about $550 for one stop round trip flights. Air time was about 6 hours each way. Our 12 day rental car was about $750 for a large SUV holding four people and gear, this was extremely good at the time because the US dollar was worth about 1.3x the Canadian dollar. Edmonton is about 4 hours east from Jasper, while Robson is an additional hour west of Jasper. Jasper is a “Parc National” and requires an entrance fee. For us it was cheapest to buy the family year pass at about $100. Two campsites for three nights on the Skyline Trail was $130, and two campsites for four nights on the Berg Lake Trail was about $200. 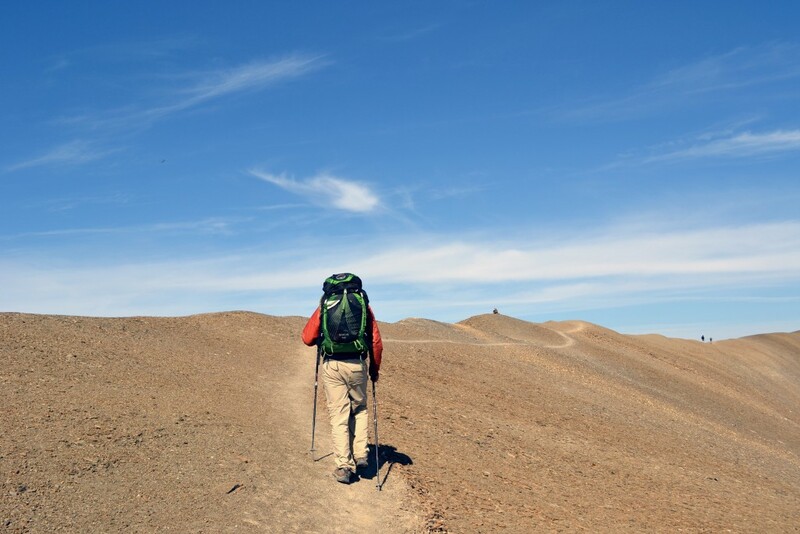 Trail food, gear, and town expenses can greatly vary depending on lifestyle. After getting to town and finding a KOA to rest our heads, we were able to spend some extra time at the Miette Hot Springs as well. These hot springs are commercial at this point and consist of a few swimming pools that are hot spring fed. Nevertheless, they are very relaxing and cost only a few dollars to enter. We headed to the town of Jasper where we would fulfill our tourist duties of shopping and our duties as beer drinking adults to visit the local brewery. We also stopped by the half a dozen outfitters for last minute goods including stove fuel that we couldn’t bring on the plane. One last stop at a tour company where we pre-booked our shuttle to get to the south end of the Skyline Trail (a one-way trail) and we were set. We had rain only at night and on a single night we had frost and snow-covered peaks lasting till mid afternoon. Temperatures at day were mostly in the 50s-60s and nights were high 20s to low 30s. If planning a trip, I’d recommend researching typical highs and lows in the area ahead of time, then adjust to mountain weather by reducing those temperatures about 10 degrees. For August and September travel, I’d recommend several clothing layers for warmth options and, although we were lucky with rain, a shell top and bottom are a must. August to September is considered the best time to go, the latter of which gives you better chances for a bug-free experience. We had very little issues with mosquitoes in late August. Both areas we visited are considered semi-primitive by the park districts, meaning that they supply safe food storage, composting privys, and tent pads. Being a higher traffic trail, larger wildlife is more scarce. We still carried bear spray as a precaution. Not being able to fly home with it, you can then donate unused spray to the Jasper Backcountry office for rangers. Both parks have trail information and booking information online. We used and highly recommend Don’t Waste Your Time in the Canadian Rockies guide books for trail details when planning. The trails are all easy to follow, but we still hiked with the maps as they are fun to reference. Town lodging booked up fast. I’d recommend pre-booking for best rates and availability. There are plenty of car camping sites outside of town. There is also cheaper lodging and more availability about 45 minutes east of Jasper in Hinton. Day 1, 12.7km to Emperor Falls Camp: There is a large but crowded parking lot at the Berg Lake Trail trail head. This trail is very popular! Don’t sweat it too much. Like many trails, the farther from the parking lot the fewer the people. The trail was immediately impressive for it’s old forest, but also notable for the wide and easy grade that we were on. The first few km are also mountain bike friendly. After getting to the Kinney Lake campsite there is a long rocky moraine and then the trail changes pretty drastically. Kinney Lake is a beautiful turquoise lake surrounded by high peaks, there are a few tips of glaciers on the peaks and slim waterfalls visible from each one in the far distance. It was a perfect stop for our Helinox Chairs and a little lunch. It is straight up from there, gaining about 600m in about 4km. 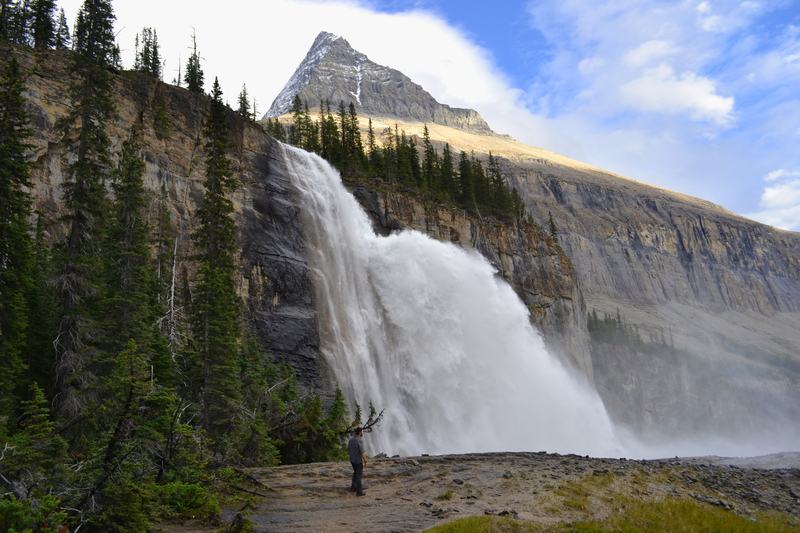 The vertical gain is more than worth it as we begin to be rewarded with high views and spectacular waterfalls. We would climb to White Falls, Falls of the Pool, and then Emperor Falls, each more spectacular than the last. Robson sticks out above Emperor Falls. We were lucky enough to also have a blue sky back drop and warm enough weather that the mist radiating off the falls felt perfectly cool. Our camp site was riverside and gave us our first glimpse of the Berg Glacier. I was immediately under the impression that we must have had the very best campsite on the trail. Simply breathtaking. Day 2, 11.2km to Robson Camp: Our next day was intentionally planned light so that we could bask in the sun looking out onto Berg Lake. This is the scene that one would find by googling the park or trail: a beautiful glacier fed lake with ice chunks from recent calving of the glacier that hits the top of the lake. The glacier climbs to the top of Mt. Robson where there were almost always swirling clouds even in the bluest of skies. Since our legs still had energy left in them, we decided to stretch them with a 5.2km round trip to Adolphus Camp past where the Berg Lake Trails end. This was a far less traveled path with more signs of wildlife, deeper woods, and complete solitude. Also noteworthy, this path takes you into Jasper N.P. and across the Alberta and British Columbia border where you also cross from Pacific to Mountain time. Time traveling, man! Day 3, 19km on Snowbird Pass Trail: The best hiking we’d see yet, just when I thought it impossible. We would hike the Snowbird Pass side trail out and back, a total of 19km and nearly 800m elevation gain. We did this as a day hike, staying at Robson for a second night. The weather made for a popular day on the trail, but still far less crowded than the main trail thanks to an early start. 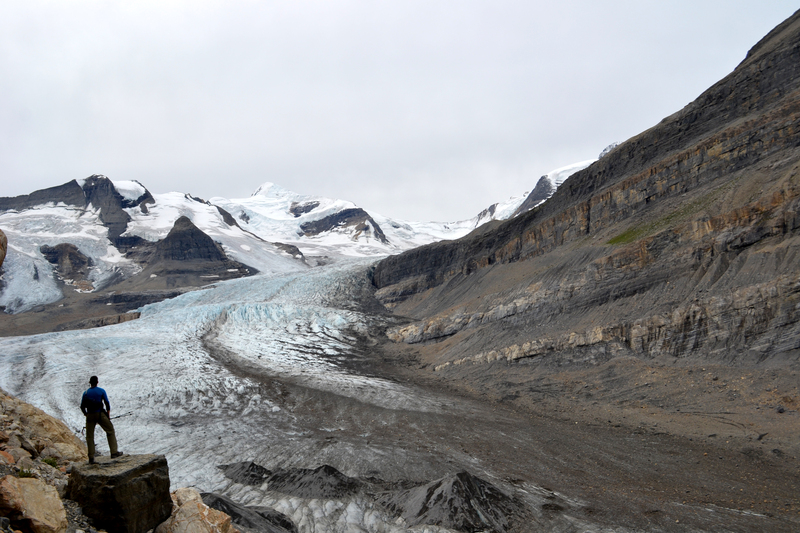 You begin by hiking back nearly to the tip of the Robson Glacier before then heading up. 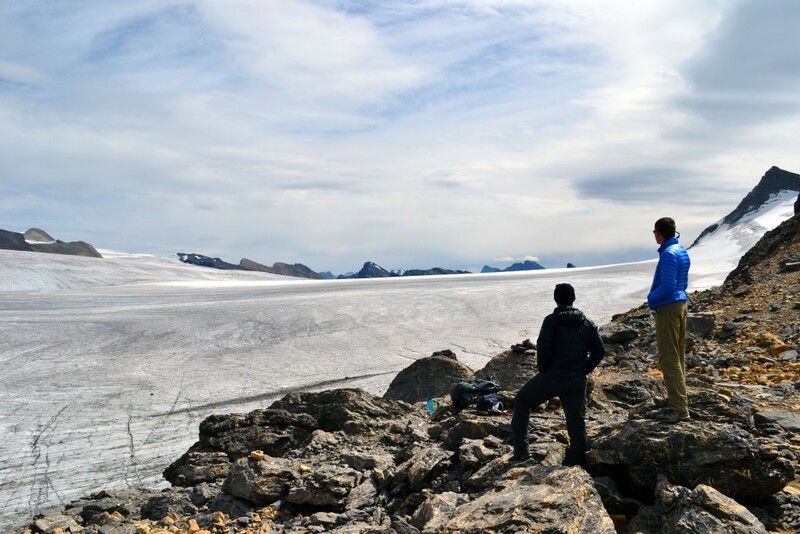 The trail skirts the steep mountain side with lots of moving scree and follows along the glaciers path now with a higher view, the further you make it the more you can see the massiveness of the glacier. Eventually the trail cuts in to more of a rolling hills meadow, a playground for the many marmots. When you enter the meadow you can see the pass between two long ridges in the far distance. Another steep climb and you’re there, directly above the Reef Icefield. From your view point you can see the ice field sprawl about 2 miles in any direction. Everyone is always so time crunched and so many people only get as far Berg Lake, but there is no doubt that the Snowbird Pass Route is the very best of Robson. Day 4, 10km ending at Berg Lake Camp: To stay with the theme of light days, our next day would include time just to enjoy the time and place that we were in. 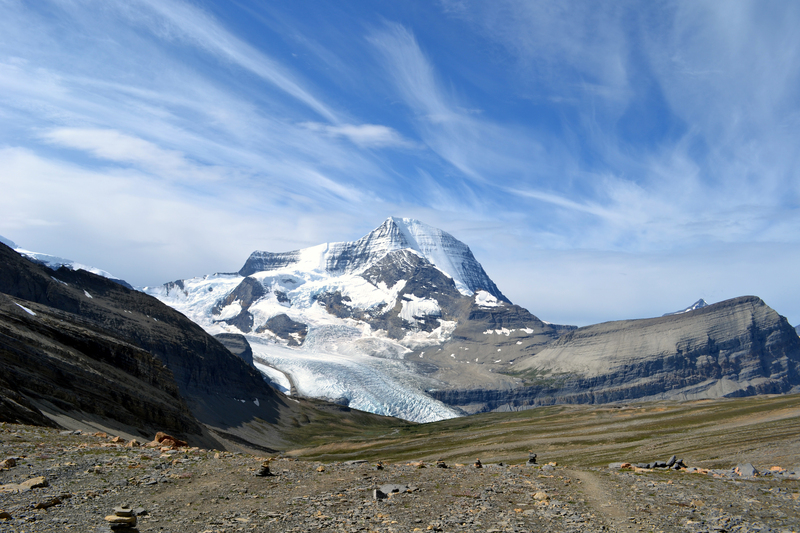 We hiked the Toboggan Falls Trail up from our next camp at Berg Lake (now working back to the car), then hiked along the Mumm Basin Route to the Hargreavas Glacier and back in a sort of loop. The trail from camp is steep and almost immediately follows the falls. I was under the impression that we were hiking to a large falls when we actually were hiking along side a long gradual falls the whole time. The trail then comes to a fork with the trail continuing up to the “cave”. The cave was not on our map, but exploration was the name of the game that day. The steep route continued to a now above treeline trail that offered amazing views again back at Robson, yet another perspective of the peak. A cairn in the distance marked the cave and we ventured to and then inside for a look. The cave is small, but has a few rooms we braved with cell phone light before turning back. The entire day was again perfect and offered a different and less traveled path, well worth it at around 9-10km and 450-500m in elevation gain. Day 5, 20.1km to the car: The way back was almost entirely downhill, back the way we came. We made quick of it as we wanted our share of town food before hiking back out the very next morning. After leaving Robson we had obligations in the quaint town of Jasper. We had to stimulate the economy with tourist purchases and make another trip to the Jasper Brewing Company. I was honestly worried about our trip to the Skyline: how could it live up to the experience we had just had? We also had concerns for the shift in winds as it clouded the immediate landscape with smoke from mega forest fires that were all over the northwest United States. Sick of the Meters and Kilometers? Here is the run down. A kilometer is 6/10 of a mile, or you could multiply by .62137 to be exact. A meter is 3 times a foot, or 3.2808 to be exact. National Geographic maps often have both and list miles/feet in parenthesis (because we’re weird for using miles/feet). Day 6, 12.2 km to Snowbowl Camp: We left our rental at the north end of the trail and were dropped off at the south trail head with 44km ahead of us. Setting out was a beautiful switchback trail past the first two campgrounds. Now with some trail legs under us we blazed up the trail and made it to our first camp way too early. Getting to the camp includes a few kilometers getting out of the trees and then the last few in high meadows with slow streams, long views, and plenty of ground squirrel and marmot. The mountains were covered with a light haze from the smoke, but not too badly. Day 7, 8.1km to Curator Camp: The entire second day was above the trees and the trail started to earn its name. We’d leisurely hike on smooth graded trails and take extended lunches to enjoy the views surrounding us. We’d also stop and venture up the Watchtower Trail to its high point to look into the next valley and over at the Watchtower shaped peak itself. The Curator camp is down in the valley from there, a significant descent on a side trail down “1km”. There is a rustic lodge just below that where many hikers passed through our camp to get to. Day 8, 11.9km to Tekarra Camp: Don’t Waste Your Time in the Canadian Rockies had suggested this trail as one of the very best and day three on the Skyline proved them right. The smoke was a little lighter on this day and th e views and trail the most spectacular. We started by climbing 120m up from camp and then over 400m more to the top of The Notch. I love this kind of hiking, very vertical, exposed, loose rock, and beautiful skies. We dropped pack and enjoyed the view, able to trace a line from which we came the day before. We also hiked up the south peak of the notch another 50m or so making it the trips highest point at 2560 meters. This side route is worth it as it gives you more of a 360 vantage point. The day was set up to be perfect and the trail continued to be such. We stayed above tree line the entire time, mostly on sharp ridges looking out at ridgeline after ridgeline in the far and fading distance. Day 9, 13.7km to the car: The Tekarra camp was beautiful and difficult to leave. The camp is below Tekarra mountain in a lush meadow. After leaving camp there are kilometers more of of high alpine meadows before hitti ng a forest service road and that’s where it gets boring. We would have a quick pace down the wide shared-use trail back to the car. The Skyline is far different from the glacial lakes and ice fields we came from at Robson, but a perfect complement with its warmer colored rocks and long looking views. Both trails were very convincing in making the Canadian Rockies a favorite destination and a must add to any adventurers’ list.